WHAT CAN BEST GLUTAMINE DO FOR YOU? 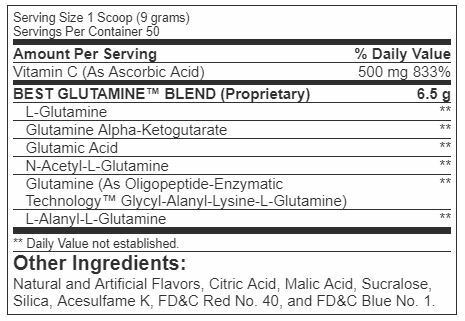 Directions For Best Glutamine: Take one (1) serving (1 scoop) with approximately 6 ounces of water or juice, or as directed by a qualified healthcare practitioner. Can be taken before, during or after workouts. On non-training days, take one (1) serving (1 scoop) first thing in the morning on an empty stomach, or as directed by a qualified healthcare practitioner. Warnings: Not intended for use by persons under age 18. Do not exceed recommended dose. Get the consent of a licensed physician before using this product, especially if you are taking medication, have a medical condition, you are pregnant, nursing, or thinking about becoming pregnant. DISCONTINUE USE TWO WEEKS PRIOR TO SURGERY. KEEP THIS PRODUCT AND ALL SUPPLEMENTS OUT OF REACH OF CHILDREN.